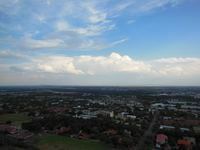 The final stop on our whirlwind Africa tour was Bloemfontein, South Africa, a city of about 400,000 centrally located in the county. 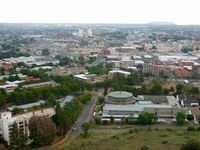 Bloemfontein is the capital city of Free State Province as well as the judicial capital of South Africa. 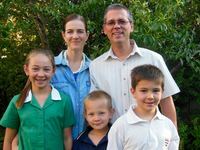 Richard Raven and his family are working there to establish Hope Bible Church. Joyce and I were blessed to spend 3 very busy days of sweet fellowship in the Raven home. Saturday morning started early as some of the young men met with Richard for a book study. This was followed by a time of prayer, and then we hit the streets around the meeting hall for evangelism. I was paired with Tsholo, and we were happy to see one of the young men we talked with actually show up for the Sunday worship meeting. 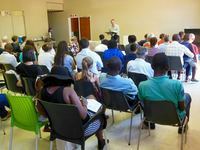 Later, several of the church members gathered for an informal meeting to discuss how to improve the evangelistic ministries of the church. On Saturday evening, Richard’s children tried to teach me the game of cricket while dad finished sermon preparation. Sunday worship with Hope Bible Church was a wonderful experience. Richard is a warm and humble brother, and a gifted preacher. The size of the crowd was great, but even more encouraging was the composition of the crowd. Here, in the heart of former apartheid South Africa, I saw exactly what I had hoped to see. The church was a beautiful mix of black and white, interacting with love and respect. 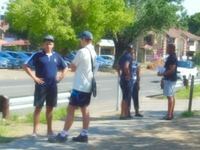 Just this week, the university in Bloem made the news for ugly racial tension. Yet I witnessed a living testimony to the truth of Ephesians 2, that Christ is our peace and breaks down every barrier of division. 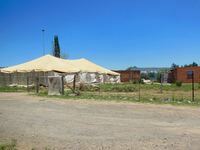 On Monday, Richard and I accompanied Tsholo for a tour of the townships to the east of Bloemfontein. Botshabelo and Thaba Nchu are sprawling black communities in a landscape that reminded me of southern Wyoming, near the border of Lesotho. 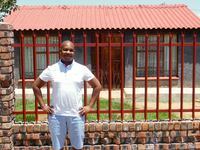 Tsholo grew up here, where hundreds of thousands of black South Africans have no biblical church with a true gospel witness. It seemed that everywhere we looked we saw temporary structures where some “prophet” promised health and wealth to his followers. Most of the people in the townships walk, ride a bike, or use public transport, yet they somehow manage to give enough so their “prophet” can drive a Mercedes. 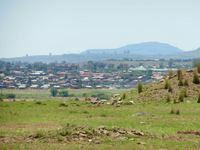 Please pray for Richard, Tsholo, and Hope Bible Church as they seek the Lord’s guidance in planting churches in the townships. Monday night we met with the young men again at the Raven home to study systematic theology. 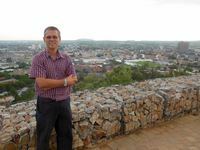 Among these young men were two gifted evangelists from the Cape area. Their zeal for the gospel and sound doctrine was fueled by a preacher on the internet named Paul Washer, and they found Richard's church on the HeartCry website. 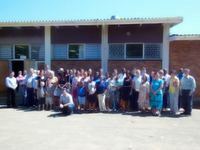 Tuesday morning we said our ‘good-byes’ and started the long journey home via Jo’burg, Nairobi, London, and Charlotte. My overall summary of the trip is nothing but positive. 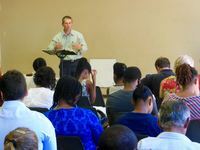 I feel that I have a much better grasp of what the Lord is doing through His faithful servants in Africa. I am so encouraged by the character of our missionaries and the quality of their work. As you can imagine, I am eager to go back and see more. 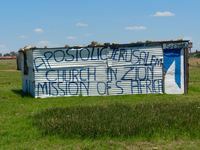 Typical tent of a prosperity "prophet"